The spring 2011 edition of Get Fresh! magazine is here, and it’s abuzz with ideas and information to help propel you into your healthiest season yet! As spring bursts with new life and hope, so does this edition of Get Fresh! ... beginning with a well-deserved tribute to inspirational health hero Jack Lalanne. Frederic Patenaude shares an excerpt from his new book Raw Food Controversies, outlining what he learned from his first year’s experience being raw. Remember that old Paul Simon Song, Fifty Ways to Leave Your Lover? 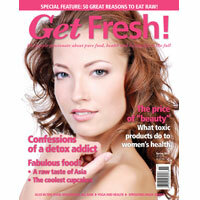 In this spring issue of Get Fresh! 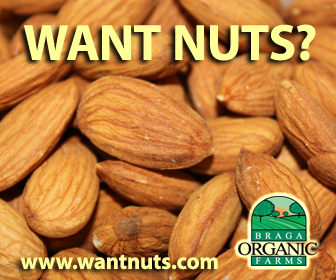 Dr. Doug Graham gives us 50—fifty!—reasons to eat raw. A compelling list indeed. You springtime detox zealots will find a thought-provoking article by Fiona Robertson on the slippery slope into detox addiction. A sobering reminder that not everything we raw foodists feel drawn to is necessarily wonderful in every instance, and that we can overdo it. Thomas Billings lends his expertise, bringing balance and reminding readers that, when dealing with health issues, it’s not wise to rely on just diet alone. Speaking of detox, expert Natalia Rose delivers a profound, life-changing admonition regarding the “price of beauty” and how young women forfeit their health and even their fertility in their toxic efforts to be beautiful, using popular (but damaging) products and methods. There is also an article from yours truly Go Raw: Invite Miracles into Your Life. This piece was inspired by an incredible story that happened to me recently. 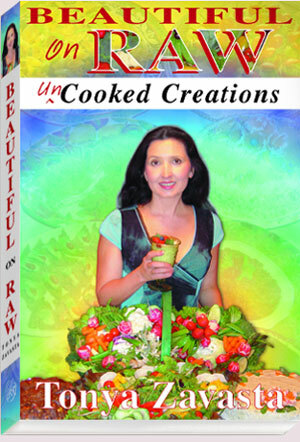 There is something more going on in the raw food world than meets the eye, the beautician's mirror, or the weight loss scale. There are, it's certain, more benefits to this lifestyle than science can now quite explain. I invite you to move beyond the realm of science and visit a new thinking paradigm made possible by a healthy, balanced raw food diet and the clarity and open mind this brings! Adding another spark to the latest Get Fresh! lineup is Australia's own Casey Lorraine with some tips on transforming your pain into a gift, as she speaks compellingly from personal experience. Like a breath of fresh air, Elwin Robinson offers some astounding information on the importance of oxygen and shares some great ideas on a subject few of us think about. There are “techniques” for breathing? Did you know? Significant stuff, much worth your exploration. Thinking about starting yoga? Frank Arrigazi packs into a small space all the basic info you need as he takes you deep into the world of yoga. 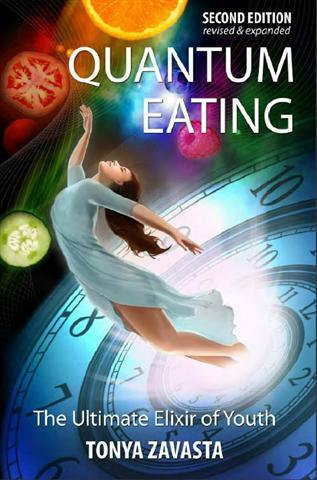 Niki Gratrix fills it out by explaining in detail how to fine-tune your “energy body” and your emotional and physical body as well, balancing out masculine and feminine energies in your everyday life. You’ll also benefit enormously from Dr. Brian Clement’s article on “Frequency Medicine”—even the title sounds intriguing, doesn't it? And Janey Lee Grace’s practical article on de-cluttering is just in time for spring cleaning. Hungry? On the food front, your taste buds will explode into spring as Karen Knowler shares everything you need to know to grow sprouts successfully. Ani Phyo gives us a peek at some astounding Asian recipes from her upcoming book. Perfectly adorable raw cupcakes appear on the scene courtesy of Amy Levin, and Mark Edmundson lends to the mix a light and luscious array of raw gourmet recipes. Finally, you’ll be privileged to get a glimpse into a day in the life of Karen Ranzi, author of Creating Healthy Children. Karen is a committed parent and health educator whose passion is helping parents raise healthy children on a raw food diet. Sarah Best and the Get Fresh! 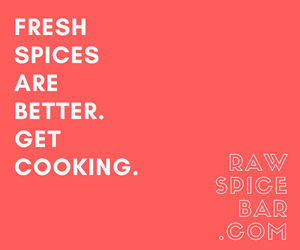 crew have assembled an array of articles with something for everyone, from the raw-food curious to the raw veteran and everywhere in between. I call this issue a “keeper”—not only a great first-time read, but full of inspirational and factual articles you’ll want to refer to again and again. This issue of Get Fresh! will equip you well for taking your health to new levels. And, true to form, they have peppered it throughout with gorgeous photos, tempting ads, and exhilarating inspiration.